A friend sent me a letter in private -she prefers not to enter in a public debate- expressing her strong objections to my claim about Mrs. Clinton's "failure to protect her Benghazy staff". I am convinced that many do not know the chronology and the truth of those fateful events and it is then appropriate to describe them here. 9:40 PM.- A well-armed assault group assembled by Ansar al-Sharia, a Salafist Islamist militia group, concentrated at the American diplomatic compound in Benghazi and surrounded it. They were soon reinforced by Al-Qaeda cadres. They started shouting "Allāhu Akbar" (God is great) and opened fire with assault rifles and grenades thrown over the wall. One Lybian guard was killed and the others fled. 10:20 PM.- The attackers entered the compound using RPGs and heavier weapons. Phone calls were made from the compound to the Embassy in Tripoli, to the Diplomatic Security Command Center in Washington and to a quick reaction force located in the Annex compound a little more than a mile (1,6 km) away, asking for urgent help. 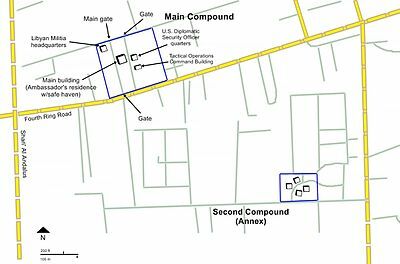 10:40 PM.- The Regional Security Office called from the compound to the Benghazy CIA annex and the Embassy in Tripoli. 10:55 PM.- After some sharp discussions, some members of the CIA's Global Response Staff (GRS) at the Annex decided to attempt a rescue and 4 members led by Tyrone S. Woods drove to the diplomatic compound in an armored vehicle. Other 29 Americans remained at the Annex waiting for instructions. 11:00 PM.- After calling twice to the Embassy in Tripoli and getting no answer, Ambassador Stevens called for a third time and asked Deputy Chief of Mission Gregory Hicks for help and reinforcements. 11:10 PM.- A Diplomatic Security Service staff called the February 17th Martyrs Brigade, a Lybian militia financed by the Defense Ministry considred an ally, asking for help. 11:30 PM.- The attackers entered the main building and attempted to enter the "safe haven" refuge. 11:40 PM.- The GRS team arrived at the consulate and attempted to secure the perimeter and locate the Ambassador and his staff. 11:41 PM.- Hillary Clinton telephoned CIA Director to coordinate. The Pentagon ordered an unmanned aerial vehicle to observe over Benghazy and arrived at location at 11:52 PM. 11:55 PM.- The GRS team withdraws with some survivors but did not find Ambassador Stevens. 12:00 PM.- The GRS armored vehicle was hit by AK-47 rifle fire and hand grenades. It was able to reach the Annex with two flat tires and some damage. 00:15 AM.- The CIA Annex came under machine gun, rocket and mortar fire. 00:55 AM.- Lybian attackers found Ambassador Stevens after accessing the sealed room ("safe heaven") through a window. 01:05 AM.- Ambassador Stevens arrives to a local hospital controlled by the Ansar Al-Sharia militia. 01:55 AM.- Ambassador Stevens is declared death by Dr. Ziad Abu Zeid, who certifies that he died from asphyxiation. 05:00 AM.- Reinforcements from Tripoli arrived to the CIA Annex. 05:25 AM.- Tyrone S. Woods, while defending the Annex from the roof, was hit by a mortar round and died instantly. Four Americans died, including Ambassador Stevens, and several more were wounded before the last remaining Americans (32 in total) were evacuated from the CIA Annex 8 full hours after the attack had started. For many days after these events Hillary Clinton insisted that the attack was resulting from a popular protest triggered by a previous drone strike in Pakistan and a video released by al-Qaeda leader Ayman al-Zawahiri. President Obama supported her position by not formally labeling the event as a terrorist attack. Investigations uncovered detailed failures on the State Department and the intelligence community's reactions, and included a Senate Intelligence Committee report in January 2014 that said both were at fault. A House Select Committee on Benghazi was created in May 2014 to examine government policies related to the consulate attack. As the State Department responded to the Intelligence Committee's requests, it was revealed that Clinton's State Department email account had no correspondence archived in its servers or computers. As a result, the State Department formally asked Clinton to turn over her Emails from her private server, which started the now-infamous Email scandal. Of the more that 50,000 pages of Emails Clinton provided to the State Department, roughly 900 were in reference to Libya and were later sent to the House Committee. So far it is not clear yet what Mrs. Clinton did, why and how to comply with her duty to defend her Benghazy staff. For many, many years, I have not even given a glance to the National Enquirer. I find quite disgusting that kind of journalism devoted to destroy the reputation of others. When a good friend of mine I certainly respect for his objectivity, gave me a copy of the November 21st issue of that yellowish rag, I did not want even to consider whatever gossip it may have. “You must read it!”, he insisted. “I am sure that you will not find irrelevant the revelations contained in this issue”. I accepted the challenge to read that piece of trash because I know that on the other hand and to be fair, the National Enquirer has a large team of aggressive investigative journalists writing under the supervision and advise of a firm of outstanding attorneys hired to make sure that reports to be published are backed by good sources and the facts behind the stories can be proven. That is why the National Enquirer is able to destroy public figures with little or no fear of losing a defamation suit in court. What this issue of the National Enquirer revealed about Hillary Clinton was really appalling. In addition to her negligence of using a personal electronic account to discuss classified matters of State while representing her country in the highest cabinet job under President Obama, the manipulations revealed behind those Emails are really astounding. Still worse is her intimate relationship with Huma Abedin. Apart from the personal connotations, Clinton’s reliance in someone who was raised in Saudi Arabia by activist Islamic parents and who has so many links to terrorist activists and institutions is a shocking betrayal to the safety of the country she was entrusted to uphold. Facing all the sordid revelations of previous years, including her failure to protect her Benghazy staff with an unexplained delay to send help, as well as her habit of refusing any responsibility for this and for her many other mistakes as Secretary of State, it is only reasonable to believe that her actions and decisions were in tandem with Obama’s foreign policy and sanctioned by him. And that is certainly a worrisome fact at a time when Islamic extremism is a global destabilizing epidemic. Clinton’s reliance in such a close confidante as Huma Abedin is completely unjustified, considering what has been recently revealed in hundreds –if not thousands– of Emails exchanged between Huma and Hillary. It is easy to understand the seriousness of these revelations when anyone takes a look at the flowchart published by the National Enquirer, showing the many connections Huma has with terrorism centers, such as the Institute of Muslim Minority Affairs (IMMA), an institution promoting the Sharia Law in non-Islamic countries, in tandem with ISIS bloodthirsty philosophy. The chain of Huma’s connections go back in time to the 1970s, when Abdullah Naseef founded the IMMA with the help of her father, Sayed Zainul Abedin. They were both involved in the Muslim World League (MWL), accused of funding 9/11 mastermind Osama bin Laden. If those links were not enough to provoke in us a healthy fear, let us consider the fact that Hillary’s intimate confidante was a member of the Muslim Student’s Association (MSA), funded by the Muslim Brotherhood and listed with 29 other organizations as those actively working to “destroy the Western civilization from within”, as revealed in a May 1991 US government report. Anwar al-Awlaki became the MSA religious leader until he was killed in a 2011 US drone strike while working as a recruiter for al-Qaeda. I did not vote for Trump because I believed that he was too unstable to become leader of the United States. I am very glad now that I neither voted for Clinton in spite of being tempted to do so many times along the 2016 presidential campaign. I chose another option, not even the Libertarian or the Green candidates, but one that merited my respect for a solid and coherent platform. He got less than 170,000 votes against the over 60-million each gathered by either Trump or Clinton. Third candidates get very little press coverage, but fourth or fifth candidates get none and most people do not even know they exist. Voters believe that they have no other choice but to vote for one of the two or three big ones. But indeed they have other choices! At this point in time I would have voted for Trump instead. It isn’t good that he won by a majority of electoral votes under the federal electoral system that gives a firm voice in the elections to the States, but lost the popular vote at the national level for nearly 2 millions more in Hillary’s favor. I suspect that this happened because many chose to vote for third or fourth candidates as I did. In particular for the Libertarians, coming third in the national results, where most votes cast for Gary Johnson were in fact taken away from the Republicans. If we all had chosen instead between the two leading candidates, Trump would have won the popular vote as well. At this point Americans have no other choices, but the elected president. Let us hope that Trump turns out to be a good CEO of the United States, if not necessarily a charismatic leader. And that a more discrete Congress will support his good initiatives, but will press firmly the brakes on his undesirable impulses. As for Hillary, it is a blessing that she lost. But she is still free to do a lot of harm, and it would be good and reasonable in a country based in the principles of law and order to go further ahead with the investigations about her deeds. No matter how important she is or has been, she is as much a citizen as anyone else who must be punished if found guilty.